The suspect is seen at the Seret Vizhnitz synagogue located at 4811 13th Avenue October 8. New York - Brooklyn District Attorney Eric Gonzalez today announced that a 50-year-old Brooklyn man was arraigned on two separate indictments for allegedly committing a string of six burglaries in Borough Park in September and October 2018, including breaking into two synagogues and a religious school. •	On September 15, at approximately 1:30 a.m., the defendant allegedly burglarized a commercial establishment located at 4520 18 Avenue. •	On September 25, 2018, at approximately 1:30 a.m., the defendant allegedly burglarized the Kedishas Aharon Synagogue located at 1350 39th Street and stole two silver crowns used in religious services. •	On September 25, 2018, at approximately 2:20 a.m., the defendant allegedly burglarized a commercial establishment located at 4605 13th Avenue. 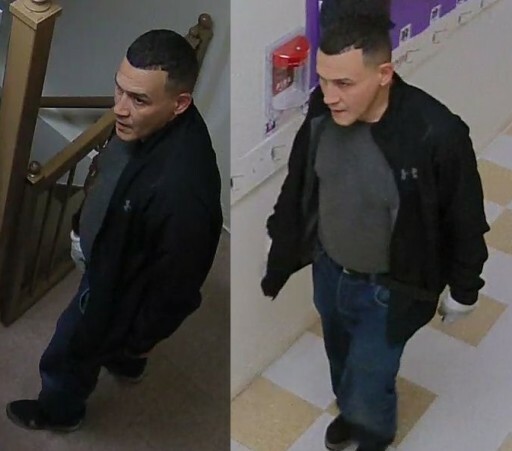 •	On October 7, 2018, at approximately 1:22 a.m., the defendant allegedly burglarized Gan Yisroel School, located at 3909 15th Avenue. •	On October 8, 2018, at approximately 4:20 a.m., the defendant allegedly burglarized the Seret Wiznitz Synagogue, located at 4811 13th Avenue. •	On October 21, 2018, at approximately 4:25 a.m., the defendant allegedly burglarized a commercial establishment located at 4724 18th Avenue. The defendant was arrested on October 23, 2018, after the New York City Police Department’s Facial Recognition Program identified him as a possible suspect. Following his arrest, he allegedly identified himself on video surveillance taken from the crime scenes and told the police where the religious items could be located. sounds like a latino, probably illegal therefore the Latino gonzalez will let him go. Well, at least he's very quiet when he goes to shul! You obviously haven't been reading the postings of Triumphinwhitehouse. He has an amazing knack for moronic comments. obviously this goniff is not antisemitic; he likes Jewish shuls!